Diverse is the word most commonly used to describe Hawaii's Big Island. There are said to be 13 climatic regions on earth and the Big Island has all but two, the Arctic and the Saharan. Not only does the Big Island have tremendous sun and surf appeal, it boasts the world's most active volcano (known as the "drive-in volcano"), unique adventure activies, and white, black and green sand beaches. The Big Island is home to several notable yearly events: Ironman Triathlon World Championship, the Senior PGA Golf Tournament of Champions, the Merry Monarch Festival (Hula), and the Kona Microbrew Festival. It is also home grounds of the Hawaiian International Billfish Tournament held in Kona, the Billfish capital of the world. Nearly every one of the Big Island 's stunningly diverse regions-from the wet lava fields of Puna to Kohala's lush valleys-boasts its own nationally recognized park. This, in addition to the many state historical sites and sanctuaries, makes the Big Island a must-see for the traveler who wants to experience Hawaii's rich cultural history and unique natural resources. Download your FREE Big Island Map (complete with island highlights)! 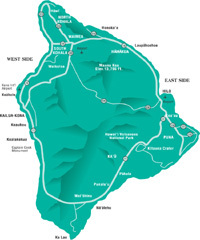 Check out GLAD Travel's Sample Itineraries & Travel Guide for the Big Island. Support GREEN & ECO-FRIENDLY accommodations like Lova Lava Land Eco-Resort!